This week has been a whirlwind. I'm recovering from migraine-unrelated surgery so days have kind of blended together and my head is still fuzzy. Not from pain killers, though, as they make my headaches worse. So do I feel kicked by a horse? Check. Run over by a truck? Check. Mashed by a lead balloon that fell out of the sky in the middle of a hail storm? Check, check, AND check. However, laughter is indeed the best medicine. So I giggle and then hold my sides. I'm looking forward to relaxing this weekend, and I hope that relaxing will include beads. Before surgery, I dug into the deep depths of my bead cabinets to pull together possible combinations for future pieces. There's some neat stuff back there I forgot I had. There's a difference between designing with a show deadline and designing with other deadlines. When I'm designing for shows, I'm constantly wondering, "Am I making the right thing? Am I on the right track? Is this what they'll really like?". I'm sure most of you feel that way when preparing for a craft show -- the thing you didn't make is the one thing everyone will want. But preparing for tutorials or Cup of Bead Soup or other blog hops feels ... lighter. Or at the very least, a different sort of stress. I'm pushing myself creatively, rather than thinking with the business side of my brain. Erin Prais-Hintz recently shared some her favorite blogs and I have to share this one, which isn't really a blog but a collection of web sites -- Lileks.com. I am particularly partial to The Institute of Official Cheer, which includes such gems as The Gallery of Regrettable Food. Regrettable Food showcases vintage cookbooks from the 40's, 50's, and 60's, and boy-o boy, are there some doozies! I'm amazed at how far photography and culinary expertise has advanced, because I do like to eat, and after looking through these gastronomic treasures -- I'd be on a permanent saltine-and-water diet. Which, on second thought, wouldn't be so bad. But then, there wouldn't be pie. And my last thought for the afternoon (I did tell you this was a totally random post, didn't I?) it feels totally weird not to have Tax Day fall on April 15th but on Monday the whatever-it-is. I wish I could earmark the taxes I'm paying toward specific things, like schools, but that's an entirely different blog post. Paying taxes is a fact of life. If you're in business for yourself, I'd highly recommend (highly, highly, SKY highly recommend) getting a small business accountant. Someone who specializes in small businesses is much more in tune to what deductions you can take, the ways inventory can be calculated, and will have solid tips for how to keep your records in following years. The relatively minor amount of money I pay my guy is worth every single penny ten times over in one, the advice he's given me, and two, the TIME he's saved me. And the best thing about having an accountant -- if you ever have the bad luck to get audited, your accountant will be right there by your side. But that will never happen to you. Nope. Not you. I hope you got something out of this really random, off-the-wall post. I almost deleted it twice but figured, what the heck, why not. I like random, after all. So give me some randomness! I love your jewelry pieces. I hate tax time - in Canada it is due at the end of April, and right now it is spread all over my dining room table! Surgery? Are you feeling better I hope? Jewelry is beautiful, taxes are not! I do the taxes all year, weekly monthly and quarterly but then i gather all that and my reports and books and take the end of year stuff to the accountant to figure out. Impossible to keep up with new tax laws! wish i culd get away with how the big corporations do it! So glad Uncle Sam had to give back to us this year instead of the other way around. And your jewelry pieces are so gorgeous! Hope you're taking it easy and are feeling better soon. I love the Eiffel Tower earrings! My life is nothing but random so I feel right at home! I hope you recover quickly from your surgery! Laughter is indeed the best medicine! Love your creations!!!! Take care!! Oh, heal fast and well my friend! And yes, tax season is such a bear, I completely agree. Give me random anyday, it makes me feel like I just had a conversation with you! You know, cause conversations are funny that way, kinda random. :-) Feel better and take care! I thought this was supposed to be an easy breezy surgery! Pain is not good no matter where it is located. I'm sorry you've got it again. I liked this post a lot, too. It was fun and interesting. And Lileks... oh the time spent there & not working! What fun! 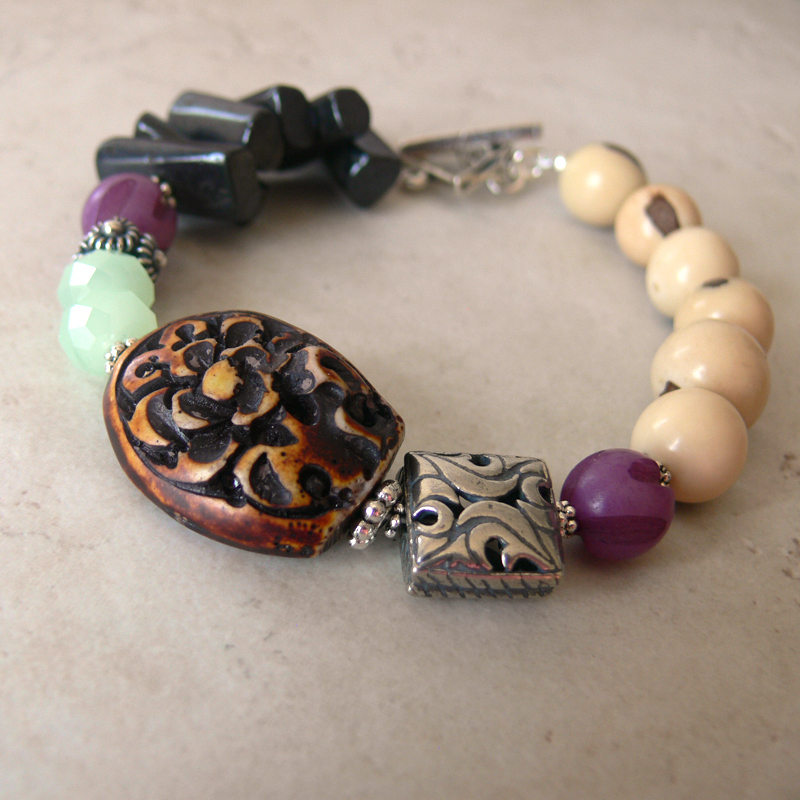 The first piece of jewelry, spring has arrived here, a beautiful bracelet. I love this. And FreeSpirit = candy the day, sweet. I wish you all the best. oh I love the Free Spirit one!!! Poor you :( Hope you'll feel better super soon! And here I was feeling sorry for myself a little bit for having the stomach flu for a few days and a very small stomach ache. Such gorgeous pieces! Love that tibetan rose...gorgeouis! Love yur randomness,a nd sure do hope you feel better. Sending good thoughts and prayers your way! and a rice krispy treat from "Noodles". Surgery? You sorta ran by that one very fast. really, Lori, please give yourself a break. You deserve some tender lovin' care. Consider some sent your way. Blessings. 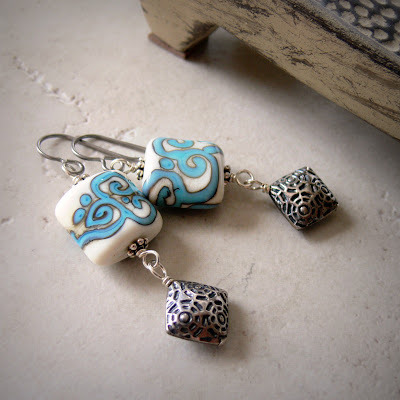 You always have great posts Lori and I love seeing pictures of your things any time! 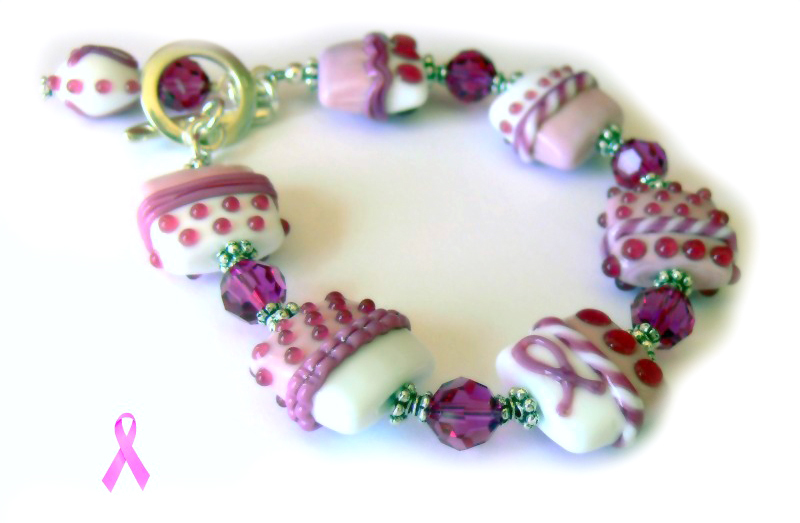 feel better soon Lori,love these wonderful pieces. Here's hoping you get to feeling better soon. You are in my thoughts and prayers! All the pieces are B-eautiful!! 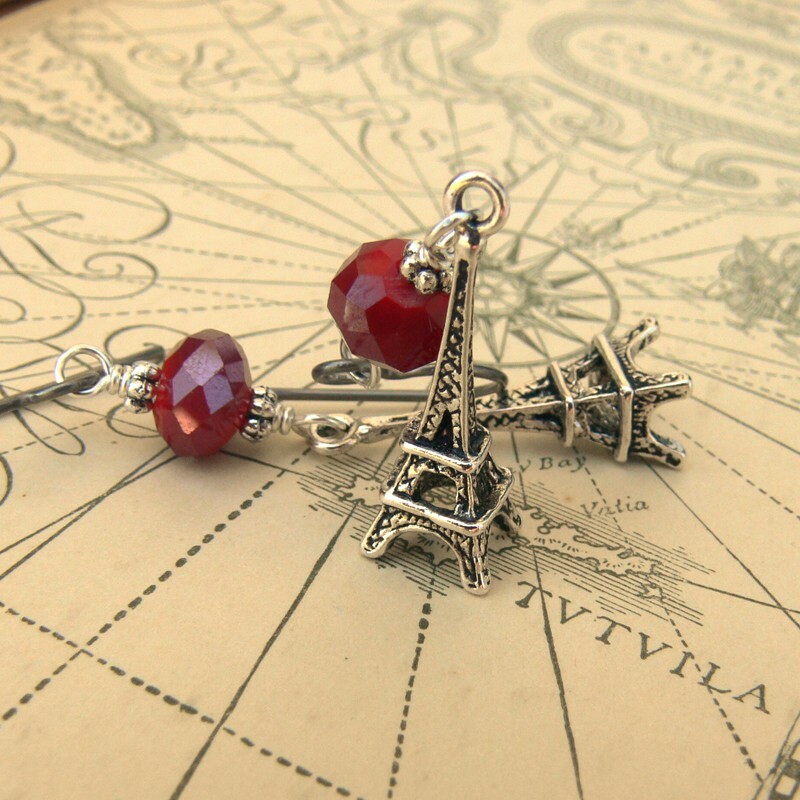 I'm totally digging those Eiffel Tower ones. Lovely jewellery! Despite the randomness this post is surprisingly cohesive. lori, please give yourself some time and rest to recover, you are such a hive of activity, girl! I'm happy you didn't delete this post. We are all a bit random from time to time. Rest & relax...something tells me you don't do enough of resting & relaxing! I hope your feeling better, The pieces are beautiful!. 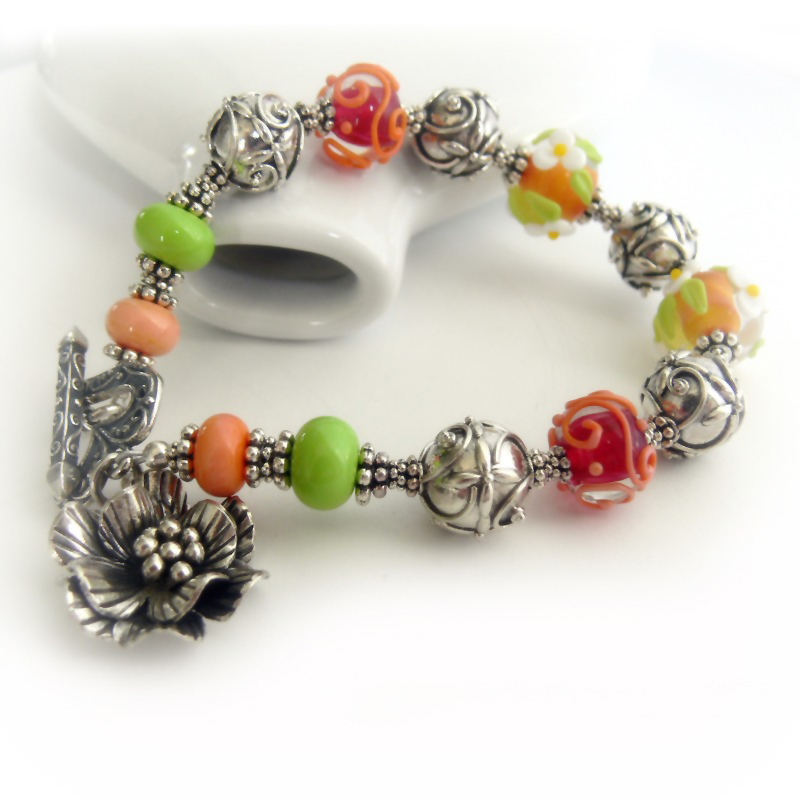 I love the playful 'april showers' bracelet! Gorgeous! I sure hope your feeling better! After being sick all week I finally was able to finish my bracelet tonight, and although I photograph everything else under the sun, I'm not so great at jewelry. Love the random post! Hope your recovery is going well :) Great jewelry!